Putting stuff between sliced bread is the best thing since sliced bread. India’s vada pav is a popular street food, and suitable for the veggie crowd. Battered and fried potatoes are tucked between buns and served with a variety of chutneys for a mouthwatering to-go sandwich. Bánh mì is a flavour-packed baguette sandwich that originated in Vietnam but is loved the world over. Typically, it’s stuffed with pork, veggies, coriander, and jalapeño. Doner kebab is a must-eat in Turkey, and popular throughout surrounding countries. Available from takeaways and higher-end restaurants, the sandwich is usually filled with shavings of lamb, veggies, and yogurt. What makes the Mexican cemita particularly special is the egg-dough bun that bookends the fillings. It may look like a hamburger bun, but it’s entirely unique in texture. Inside, you’ll usually find fried beef, avocado, and cheese. is a popular cornflour cake served across South America. In Colombia, arepas are stuffed with chorizo and chili sauce for a kick. Breaded, fried meat is served on white sandwich bread with mayo and mustard for the Japanese favourite katsu-sando. Every hearty sandwich in Canada has smoked meat, which is similar but smokier and spicier than pastrami. It’s often served cold on thick rye bread with mustard and gherkin. It’s no secret that the yeasty paste Vegemite is an Australian favourite. Spread it on toast and add cheese for a simple Vegemite sandwich any Aussie would be proud of. If you’re looking for a new drunk food, you found it. Simple and savoury, the Cuban medianoche takes sandwiches back to basics, with no lack of taste. Mustard, pork, ham, cheese, and gherkins are layed over sweet Cuban bread, pressed, and traditionally eaten as a late-night, post-partying snack. The chacarero is massive, tasty, and usually served with a heap of turkey or steak, but what makes the Chilean monster sandwich unique is the green beans piled high between the buns. In Venezuala, it’s common to have any variety of fillings between cornmeal arepas. Arepas are popular for every meal, and you’ll regularly find avocado, cheese, and plantain inside. The Chinese donkey burger is exactly what it sounds like. Shredded donkey meat in a bun is popularly served on the streets of Baoding City and the specialty of several restaurants. Legend has it that the tasty trend originated during a military food shortage. Portugal’s proud mess of a sandwich, the Francesinha, is a savoury and juicy sandwich stuffed with the meat of your choice – often ham or sausage – smothered in a beer and whisky-based sauce, and topped with cheese and an egg. You’ll be full for days, but you won’t be sorry. Smørrebrød is the umbrella term for open-faced rye sandwiches that are all the rage in Denmark. Toppings vary, but often include fish, veggies, and paté. Leberkäse semmel is a seriously pared-down sandwich. A thick slice of meat (usually a combination of beef, pork, bacon, and onion) is served on a semmel roll and eaten hot, with mustard if you like. Served in most cafes, it makes for a simple and efficient fuel-up. Popular both in the cafes and homemade by mum, jambon beurre is a baguette sandwich typically smothered with butter and stuffed with ham, cheese, and gherkin. The South African Gatsby is definitely great, but also quite simple, despite its massive size. Chips and bologna are stuffed into an Italian roll and served with ketchup, piri piri, and lettuce. The Guardian said it best, describing the classic Dutch broodje kroket as “log-shaped nuggets of meat ragu” that are battered, fried, and stuffed into rolls or between slices of white bread with mustard. It’s common to drizzle sweetened soy sauce over the fillings, and enjoy hot. Zapiekanka, an open-faced baguette, is a popular street food throughout Poland. Typically an extra-long baguette is covered in sautéed mushroom, onion, and cheese, baked in the oven, then drizzled with ketchup once cooled. Porilainen is a simple Finnish favourite. Slices of pork sausage are served on white bread and topped with veggies, garlic flavouring, and mayo, mustard, or ketchup. The Argentinian choripán is a spicy combination of juicy meat and fresh flavours between bread. Typically you’ll find chorizo sausage tucked into a thick bun and covered in chimichurri salsa. Add an egg for an extra savoury boost, and be prepared: The sandwich packs a peppery heat. The tripleta is a street food favourite and a meat-lover’s dream. The sandwich gets its name from the trio of grilled chicken, ham, and beef served on a sweetened sandwich roll. Add mayo, ketchup, or mustard for a boost of flavour, not that you need it. A bocadillo is a Spanish sandwich served exclusively on baguette-style bread. Inside, it’s all about the meat or egg – you’ll rarely find veggies beyond the occasional tomato to add moisture. The sandwich can be eaten cold or hot, and is often served from food stalls or whipped up at home. If you’re scouting for snacks in a Malaysian street market, the roti john is a classic. A meat omelette and veg are smothered in mayo and hot sauce, or ketchup, and served between thick baguette halves. 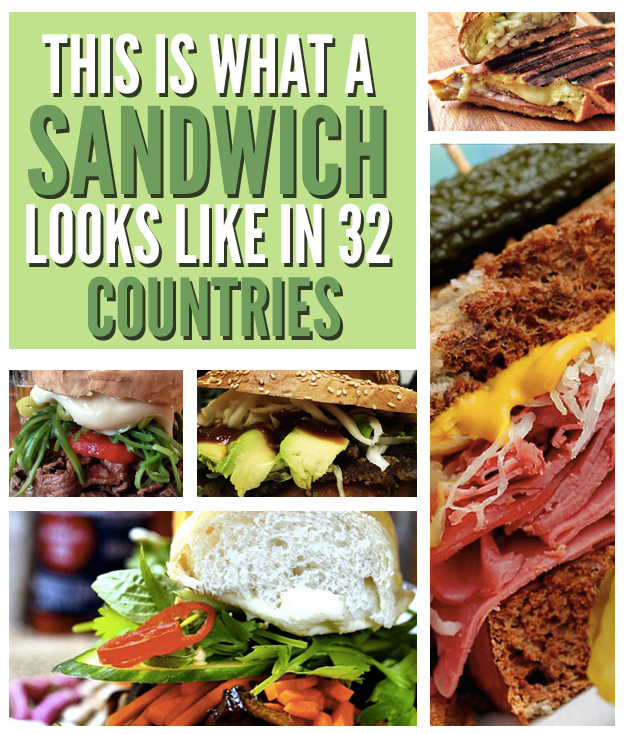 The sandwich is also popular in Brunei and Singapore. Pljeskavica is the Serbian equivalent of a burger, but made unique by the use of flat brown bread called lepinja. A basic pljeskavica is made up of a ground patty, usually made from beef and or pork, topped with cheese and cabbage. If you’re not on a date, add urnebes for a garlicky kick. Save your cheat days for a trip to Belgium. The mitraillette sandwich is famous for a load of frites piled high on top of fried meat and smothered in mayo. Kaya toast is a sweet sandwich that is widely popular in Singapore and Malaysia. White bread is smothered in butter and kaya jam (made from coconut milk and egg), and some versions have the toast cooked in a coconut milk mixture in a manner similar to French toast. Typically it’s served for breakfast with a half-boiled egg. Macau’s pork chop bun is a unique fusion sandwich combining Asian-marinated pork with sweet Portugese bread. The specialty was featured by Anthony Bourdain in 2011, and has gained worldwide popularity since then. The Italian panino (surprise, there’s an actual singular of panini) is hard to escape all around the world. You can get a toasted sandwich labelled “panini” in just about every corner coffee shop, but let’s not forget that the crunchy-on-the-outside, melty-on-the-inside worldwide favourite got its start in Italy, and typically features cheese and tomato or basil pesto melted between think slices of bread. Called the bosna or bosner in Austria, this hearty sausage sandwich is popular in street markets, and pairs great with an Austrian beer. You’ll typically get onions, peppers, curry spices, and mustard heaped on your sausage and stuffed into a bun. The bauru is a Brazilian roast beef sandwich served on a French roll. Top with mozzarella, gherkins, tomato, and oregano for the full experience. The chivito is a staple sandwich in Uruguay. Steak is served on a small roll and topped with veggies and an egg, and you can find the meal served at high-class restaurants, dives, and home barbecues.